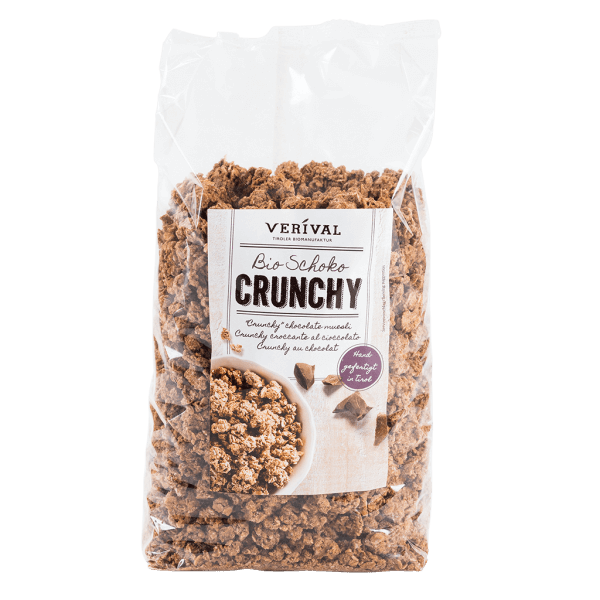 Crunchy clusters of oats and wheat, sweetened with raw cane sugar, mixed with whole milk and dark chocolate chips, then toasted and mixed to perfection by hand in the Austrian Tyrol. Deliciously biscuity and 100% organic. Good morning! Oat flakes*, rae cane sugar*, wheat flakes*, high-oleic sunflowerseed oil*, milk chocolate* 3,3% (sugar*, milk powder*, cocoa paste*, cocoa butter*, sweet whey powder*, emulsifier: sunflower lecithin*), dark chocolate* 1,8% (cocoa paste*, sugar*, cocoa butter*, emulsifier: sunflower lecithin*), wholegrain rice crispies*, cocoa powder* 1,3%, coconut rasps*, salt.